A brand aligned CX strategy that delivers on your brand promise. Is your CX strategy unique to your brand or is it so generic that it can be claimed by any organization? If your strategy includes language like “customer first”, “customer centric”, “customer obsessed” but you haven’t yet codified how that comes to life in a way that is unique to your brand, you may need to spend more time marrying your CX strategy with your brand. A Customer journey map to lead your organization to a desired state. You’ve gone through a customer journey mapping process, and it notes both the current and desired state of your organization across all customer touchpoints. Did you co-create with your most important audiences by including your customers and employees in the process? A CX Playbook that tells your CX story and outlines behaviors that bring your CX to life. 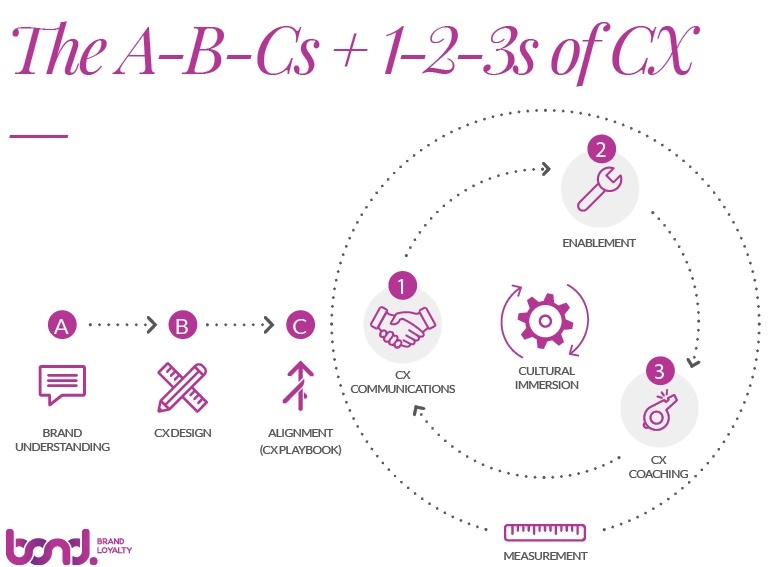 A CX Playbook that includes; your CX statement, tells your CX story, and lists the specific behaviors that bring your CX to life at each moment of interaction between your brand and customer. Do you have an asset that you can lean on to ensure alignment across your organization? This involves plans to communicate, train, and coach your employees. Plus, a good roadmap will include key measurements to show the return on your CX investment. Have you created a culture roadmap that ensures customer-centricity will move from words on a page to a way of being? Every interaction is Loyalty in the making or breaking. Here’s a closer look at how all the ingredients work together to create a customer centric organization. Experiences, whether customer experiences, employee experiences, or channel-partner experiences will continue to be the only way for brands to stand apart and leave memorable and shareworthy impressions for your most important audiences. If you are interested in learning more about how to design, execute and sustain your CX intiatives please connect with us. Latest Research: Loyalty Report 2017 - North America's largest report on loyalty.